I have been driving Jeeps since 1996. Real Jeeps. Jeep Wranglers. None of that cushy living room sofa giant beast crap out there that you suburban types like so much. Sure, they're a bit on the simple side, even crude. I can see the sheet metal that makes up the part that we call The Bucket when I sit down in it. That is by design. It doesn't need extra frills like layers of plastic to muffle the noises and make things all "pretty". Plastic is optional, it will just break anyhow. It is as simple as you can get for a car. At least it was. 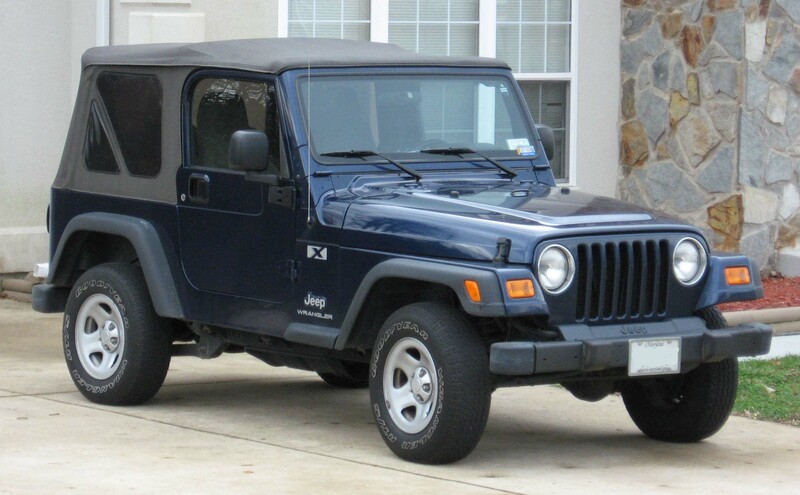 Mine is a 13 year old Jeep Wrangler TJ. 4 Liter Inline Six Motor designed by AMC. That motor could be called the last gasp of AMC before it was bought by Chrysler. Chrysler knew a good thing and kept it in production until 2006 when they went with a V6 that is slightly smaller. It's predecessors date back to the early 1960s, so you know it was a keeper. Pushrods and all that sort of mechanical "stuff" made for a tough motor that really didn't need a lot of electronics to keep it going. I'll keep my straight six, thank you very much. I had a repair to do to it because, Jeep. You see Jeeps have the reputation of being tough but they also have a problem with their electronic controls. You get a check engine light that comes on around 40,000 miles and people scratch their heads and say "It's a Jeep" and walk away. Meanwhile that light stays on and you're annoyed. Thanks to my buddy Craig who gave me his old code reader, I was able to find out that the throttle body sensor wore out. I replaced it in my driveway. The only grief was the mosquito bite I got while bent over the hood. No codes, no lights. Happy Jeep, Happy Jeeper. We noticed that there was a Jeep sitting in a driveway a block or three from the house on our dog walk. Someone was putting it out to pasture... or rather selling it. Good price too, 8900 for a Wrangler that was newer than mine. Of course mine is Cherry and in Good To Excellent Condition With Low Mileage (45K) but that's a different story. I don't think they'll miss that Jeep. There was a Black TJ sitting next to it all lifted and chromed and basically pimped out. So there's still a Jeep "In the family" for when they want to go ride. I saw it, and wondered how long it would take to sell it. One day it was gone. I thought it was sold. I walked past the property and up to the park when I saw that Jeep making a very tight turn. Too tight, the wheels rubbed with a "VRRRRT!" sound. If you put too tall a tire on a Jeep, they will rub. You can fix that by loosening a bolt. "Oh you heard that? I don't know..."
"It's easy to fix! Just a bolt!" I went into my Jeep Guy Geekery full on at that point. Showed the woman then and there which bolt and told her to look online for my blog. "I did the same thing. Put 31s on mine and took all sorts of pictures to show you what to do. It's a 15 minute fix if you rush, 5 minutes if you take your time!" I told her to keep an eye out for the AC Controls since the resistor pack burns out. You can fix those too, but they're annoying to get to. I'm on my third one. They usually last about 20,000 miles if you keep it on 3 instead of 4 like I always did. 4 is just too damn loud but you don't hear it once you're over 55MPH anyway. Soft tops are loud, no way around that. She smiled and thanked me over and over and took off with a quick chirp of the back wheels. New learner to a stick. You need a stick, at least once in your life. A stick shift gives you a healthy respect for what your car does. Much more of a primal feel instead of the numb computer-room feel of an automatic transmission, especially one of those new Continuously Variable Transmission. Those things turn your motor into a constant drone that gets wearing after a few minutes. The motor runs at peak torque the entire time and never changes. Monotonous. I went on my way. Never saw her or the Jeep again. The motor sounded like silk so she got a good one. I know I did. You see, I went in for an overdue oil change the other day. The man behind the counter hinted strongly that he wanted to buy my car. Nope! I don't want a computer room on wheels. I'll stick with my car. "You know, I understand I can get classic plates for it now. How about THAT!" I left with an oil change and a new air filter and a big ol' smile on my face. If that car doesn't make you happy every time you get in it, why have it?